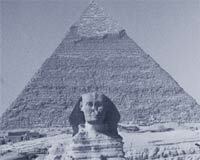 to the wonders of the Pyramids and Sphinx. away at each turn of the corner--or fairway! Day 1 — Arrive in Cairo, exciting, bustling capital of Egypt. Step into the wondrous world of pyramids, deserts and more. Day 2 — This morning a visit of the legendary Pyramids of Giza, where you will find Cheops’ Pyramid, one of the Seven Wonders of the World, and the Sphinx, carved from a single piece of stone! This afternoon is free for you to visit the Egyptian Museum, tour Old and New Cairo, take a tour to Memphis and Sakkara, test your bargaining skills at the bazaar or just relax. Day 3 — Today tackle your first round of golf in Egypt! Dreamland Golf Resort, only a few miles from the Great Pyramid, was designed by Karl Litten, famed for designing Dubai’s Emirates GC. It is extremely long with tight fairways but with five sets of tees it is enjoyed by all! Day 4 — Your next challenge will be the internationally acclaimed Katameya Heights Golf Resort. Designed by Yves Bureau the two superb desert courses (27 holes) feature quick, undulating greens and rolling fairways bordered by sandy wasteland. The many elevation changes offer spectacular views and with five sets of tees this long course can be enjoyed by all level of golfers. Day 5 — Today fly to Luxor, where you will be met and transferred to your hotel. This afternoon cross the Nile to visit the Necropolis of Thebes. Explore the Valleys of the Kings and Queens, visit the Temple of Queen Hatshepsut and the Colossi of Memnon. Day 6 — Your last round in the Land of the Pharaohs -- Royal Valley GC was designed by famous architect Arthur Davis. It has wide rolling fairways and well-protected greens on the front nine and tight fairways with sandy waste areas on the back nine. A selection of tees provides an enjoyable challenge for all golfers. Day 7 — Time to depart Luxor for your next adventure. RED SEA — World renown for its incredible diving, the Red Sea offers an infinite variety of brilliantly-hued fish, corals and rare marine life -- and now some great golf! HURGHADA — long famous for water sports has now added golf to its many attractions! The Soma Bay Golf Resort offers challenging golf and invites you to enjoy swimming, sailing, and diving in beautiful, clear water. SHARM EL-SHIEK — is a resort with moderate year round climate, a perfect setting for the Jollie Ville’s Golf Resort. Your days are filled with super golf, relaxing on the beach, swimming, sailing and exploring the underwater treasures. CRUISES — Egypt is famous for its Nile Cruises, but now has new cruise adventures to offer! CLASSICAL NILE CRUISE — the magic of a cruise along the Nile is not to be missed! Visit the temples and ancient sites along the famed river. ABU SIMBEL CRUISES — are now available on Lake Naser. Enjoy 3 or 4 nights cruising between Aswan and Abu Simbel where you can visit the temple and marvel at the feat accomplished in moving this ancient site.